Gallia Academy senior Josh Faro, seated second from left, will be continuing his baseball career after signing with the University of Rio Grande on Monday, March 18, 2019, at the GAHS library. Josh is joined in front by his parents, Dave and Bev Faro, and brother Jake Faro, right. Standing in back are GAHS assistant Jack James, GAHS baseball coach Justin Bailey, Rio Grande baseball coach Brad Warnimont, former GAHS coach Rich Corvin and GAHS assistant Jeremy Brumfield. CENTENARY, Ohio — Fulfilling a dream while also keeping his priorities in a proper frame of mind. Gallia Academy senior Josh Faro will be continuing his baseball career after signing with the University of Rio Grande on Monday, March 18, 2019, inside the GAHS library. Faro — a three-year starter and three-year letterwinner through his junior season — has been the Blue Devils’ ace hurler over the last two years and is coming off a 9-1 campaign that resulted in a second-team All-Ohio selection. The southpaw is 20-5 in his prep career and has a 1.53 earned-run average in 166 innings on the mound. Faro also has 211 strikeouts and 50 walks over his first three seasons in the Blue and White. Faro — a three-time All-Ohio Valley Conference performer and two-time all-district selection — has always wanted to play baseball at the collegiate level, and being able to do so in his own ‘backyard’ was something that truly resonated in his decision. The fact that the University of Rio Grande also offers majors in both of his planned fields of study also played a part in his choice. “It’s an amazing opportunity to be able to continue both my academic and my athletic career,” Faro said. “I’m playing baseball and doing what I love while working on a career in a field that I am passionate about, plus I get to do all of this close to home. Faro was nearly flawless during his 2018 campaign, winning his first nine contests before losing a 1-0 decision in eight innings during a Division II district semifinal against Hillsboro. Faro fanned 108 batters and walked 17 in 68⅓ innings of work a year ago, which resulted in a 1.1.3 ERA for the season. First-year GAHS baseball coach Justin Bailey served as the pitching coach last year during Rich Corvin’s final season as skipper, so the rookie mentor is well-aware of what he’s inherited on the mound. 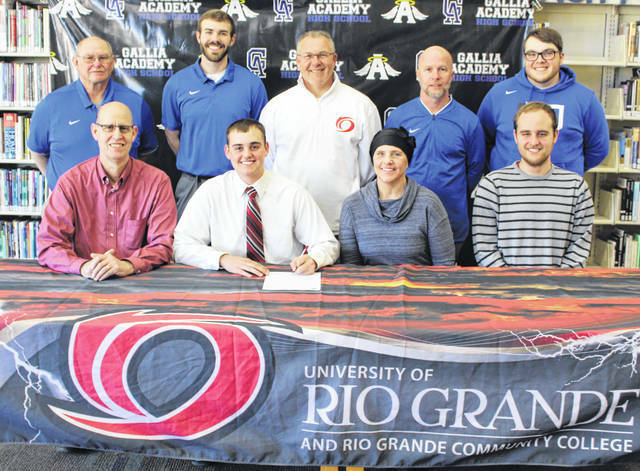 A former standout pitcher himself during his playing days at GAHS, Bailey also believes that Rio Grande is getting a solid addition to its established program. “As his pitching coach last year, I learned pretty quickly that he cognitively knows what it takes to get people out. He understands all of the finer points of pitching, rather it be holding runners on or doing whatever it takes to get an out,” Bailey said. “He has a very good mental approach to the game, he has the tools and the intangibles to be very good at the next level. He also knows what works for him and what he needs to improve on. University of Rio Grande baseball coach Brad Warnimont was thrilled to be adding a young man like Faro, someone that has proven himself at a high level over time while also proving to be a good citizen and student. Faro holds a 3.76 grade-point average and plans to have dual major in Biology and Chemistry. Faro had a productive freshman campaign at Gallia Academy, going 6-1 overall in 46 innings of work. Faro struck out 38 and walked a dozen while posting a 1.83 ERA. His transition to the No. 1 starter spot proved a little rough his sophomore season after going 5-3 with a 1.63 ERA in 51⅔ innings of work. Faro recorded 65 strikeouts and issued 21 walks in 2017. Faro has been part of OVC and sectional championship squads over his prep career, so the senior is hoping for one last run with the Blue Devils this spring. Faro also knows that a baseball future is there waiting after graduation, and that is something that he feels ready for. Josh is the son of Dave and Bev Faro of Gallipolis.